The Rolling Stones have been the subject of several cinematic presentations over the course of their career. So what makes Shine A Light worthwhile to the average audience? The intensity of the rich cinematography! The unparalleled focus on the band in action reveals an intimate and fascinating study of the Stones in a seductive concert environment. Unlike their recent Four Flicks & The Biggest Bang DVD releases, this live concert performance highlights a radical new twist to attract and thrill concertphiles: the unwavering eye of the camera stalks the individual members of the Rolling Stones as they make music and magic on stage together. Mick Jagger, Keith Richards, Charlie Watts and Ronnie Wood comprise the World's Greatest Rock'n Roll Band. The infamous quartet is aided on stage by an entourage of complimentary musicians that craft the sound of the Rolling Stones on stage. Established in 1962, this touring unit has sound roots stretching back to 1989's Steel Wheels Tour. Beginning in 1981, the Stones have broadcast live Pay Per View tour performances on American cable networks. Taking advantage of modern media, the band has multiple titles now available on DVD. In comparing the 1991 iMax film At The Max, this new performance is not just larger than life, the Stones appear to be LIVE in action as seen on a jumbotron. Witnessing the Stones up close and personal does not get any better than this. Appearing with the Stones, during dual performances at the Beacon Theatre in New York City, were Jack White on "Loving Cup", Buddy Guy on "Champagne And Refer", and Christina Aguilera on "Live With Me". The band has routinely invited guest artists to join them on stage for spectacular jam sequences. By welcoming rising stars to sing duets, Jagger's strategy is to draw upon the young & the hip to check out the Stones on the silver screen. The challenge in recording another Rolling Stones concert on film is fueled by the boundless energy and hyper activity of the band. This British Invasion institution does NOT disappoint. The Stones are on fire. The sight is clear and the sound is crisp. The motion of the music choreographs itself. The intoxicating performance compels one to clap in appreciation. The choice in selecting a vibrant theater setting for this incendiary performance was the right decision. There are plenty of stadium and arena Stones appearances that are preserved on celluloid. Jagger's vital vocals and the musical muscle of the Stones are a lethal combination that will enhance the legendary status of this band for decades to come. One subplot within the fabric of this film addresses both the director's and band's concern over the choice of material selected for the soundtrack. Rolling Stones setlists DO matter. These two stellar Beacon performances showcased a revised and rare glimpse into the extended song catalogue of the Stones. A few other musical treats were left languishing on the cutting room floor because of time constraints. Jagger selected a strong collection of songs that have not appeared in previous concert films or on prior live albums. "Shattered", "She Was Hot", "As Tears Go By", "Some Girls", "Far Away Eyes" and "You Got The Silver sung by Keith are a few of the standout performances. 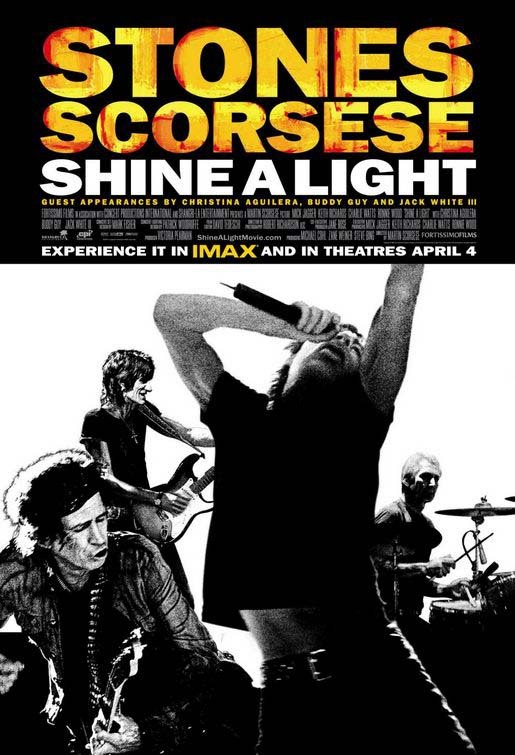 Unfortunately "Shine A Light", the title tune of the film, is not included as a performance. Thankfully, there are several bonus tracks on the double disc CD. Inexplicably, there are a handful of incongruent moments that impede the impact of Shine A Light. One has to ask why the Rolling Stones made the conscious decision to politicize their new iMax production. Interjecting the Clintons into the scene mix will be identified many moons later, after the Stones cease to roll, as simply an unwelcome distraction. Keith Richards is featured singing two songs in the film. It is tremendous to have "You Got The Silver" finally captured live for posterity. However, it is indeed an insult to interrupt Richards during "Connection" by cutting in and out of his performance with archival interview footage. What were they thinking? Keith has earned and deserves equal time before the camera. Strangely enough, film director Martin Scorsese interjects himself as the movie reaches its denouement, not once but twice! It is peculiar that Scorsese is the last face seen in the ending edit rather than members of the Rolling Stones themselves! As the camera pans above the venue, the name of the band appears on the marquee. As the shot pulls above the sprawling metropolis after dark, the moon morphed into the Stones' signature fire engine Red logo. That was a nice touch! Still, this is the ROLLING STONES live in concert; what an egotistical act by a famed director to manipulate the end of a film. It is unfathomable that Sir MPJ agreed amicably to this cinematic intrusion. All five of the principal participants in this production were born of the same generation. But this insignificant fact does not grant the director license to abscond second tier billing alongside the Rolling Stones in their shining stage performance live from New York. The Stones have been rolling for 46 years and show no signs of retiring from the stage. If practice makes perfect, then the Rolling Stones are unquestionably the living embodiment of music in motion. The Rolling Stones are poised to celebrate their Silver Jubilee in July 2012. Fifty years is an incredible milestone considering this rhythm & blues combo was launched by the departed Brian Jones and Ian Stewart. Shine A Light is dedicated to the memory of Ahmet Ertegun who fell back stage prior to the October 29th concert date. The Stones had been signed to Atlantic Records during the mid-1970s when Ertegun was head of the label. A lifelong friend of the band, his injury and passing was an unforeseen tragedy. Paramount Classics, distributor for the new Martin Scorsese motion picture Shine A Light, stipulated that all media personnel who requested Media Credentialing to cover the Rolling Stones Press Conference scheduled at the New York Palace Hotel on Sunday, March 30th, had to attend a Press Screening of Shine A Light in advance of the Press Conference. Being blessed with an advance viewing of Shine A Light was alright. Although not presented in iMax form, the concert film was still mighty vibrant to watch from the front row. The sound system was audibly stunning. This latest installment of celluloid Stones may be their best live appearance captured thus far. 100.7 The Bay morning disc jockey Chris Emory hosted the Senator Theatre special advance screening of Shine A Light on Tuesday, April 1, 2008. The radio station, in conjunction with several other sponsors, gave away promotional passes to winners lucky enough to score an invitation for two to attend the Rolling Stones concert movie premiere in Baltimore, Maryland. The excitement of the Stones fans filing into the historic theater waiting to see their rock heroes on the silver screen was like static electricity circulating through the audience. True to form, the Stones rocked the picture show house with 17 of their incendiary classics that thrilled and entertained the captive crowd. Shine A Light premiered in the iMax Theatre at Tropicana in Atlantic City, New Jersey. This amazing concert film seen in the iMax format is far more visually engaging than an average movie theater. The Rolling Stones explode on stage before the audience in this expanded mode. Once the Stones hit the stage, the action is constant and the expression of energy is unparalleled. The film projection initially began in a reduced viewing parameter. Right at the moment the Rolling Stones storm the stage, the screen is enveloped entirely by the iMax presentation. Scorsese's direction embellishes the intensity of each band member's individual movements. This Manhattan performance is larger than live, and the iMax format grants everyone an incredible experience with a front row seat for the Rolling Stones.